If variety is the spice of life, you’ll want to incorporate the following spices into your menus—and not just for taste but health, too! Studies have shown that some spices contain phytochemicals that may help prevent health problems such as high cholesterol, arthritis and more. Chili Peppers. The main ingredient found in chili peppers—capsaicin—may help relieve minor arthritis aches and pains of muscles and joints, may help backaches, and may help sprains and strains. And the hotter the pepper the more capsaicin. Add jalapeno peppers, cherry peppers, and habanero peppers into your diet for capsaicin benefits. Cinnamon. In a 2003 study, cinnamon was shown to lower blood glucose, cholesterol, and triglyceride levels. Cinnamon may also help protect against Type 2 diabetes. While cinnamon is a main ingredient in cinnamon rolls, pumpkin bread and more, it also adds wonderful flavor to coffee, oatmeal, and sweet potatoes. Curry Powder. 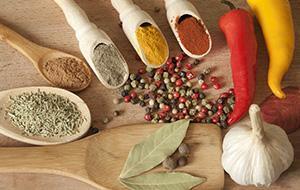 Curry powder is a mixture of spices, mostly consisting of cardamom, coriander, cumin, and turmeric. Turmeric is known as an anti-aging spice and for its anti-inflammatory properties. And the yellow pigment found in curry powder—curcumin—is being studied for its ability to help fight Alzheimer’s Disease. Garlic. May Improve heart health. Researcher has shown that garlic may lower cholesterol and triglyceride levels. Wasabi. Real wasabi, which comes from the rhizome of wasabia japonica, has anti-inflammatory activity and may help relieve seasonal allergies.